One night in the house, one million bucks, no questions asked. But there is a catch for anyone who accepts the offer. Murder is a way of life at the House on Haunted Hill, a jolting, effects-ramped remake of William Castle’s 1959 cult classic. Produced by Robert Zemeckis (Contact, Beowulf), Joel Silver (Suburbicon, Predator), and Gilbert Adler (Constantine, Tales from the Crypt), and directed by William Malone (Feardotcom, Parasomnia), HOUSE ON HAUNTED HILL stars Geoffrey Rush (The King’s Speech), Famke Janssen (X-Men), Taye Diggs (Empire), Ali Larter (Resident Evil: The Final Chapter), Bridgette Wilson (Mortal Kombat) with Peter Gallagher (Covert Affairs) and Chris Kattan (The Middle). 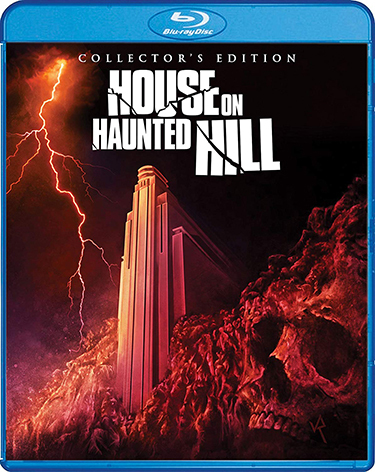 On October 9, 2018, SCREAM FACTORY is proud to present HOUSE ON HAUNTED HILL Collector’s Edition Blu-ray, which includes new 2K scan of the film, new interviews with cast and crew, and much more! Geoffrey Rush plays twisted theme park bigshot Stephen Price, who’s hosting a birthday bash for his wife (Famke Janssen) at a house that was once an institute for the criminally insane. Five strangers are each offered a chance to earn one million dollars if they can survive a night in the house. But what starts out as a harmless birthday prank soon turns into a night of horrific terror.